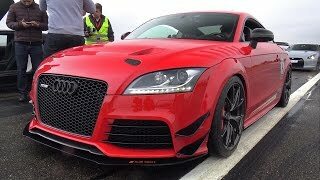 The front-wheel drive Audi TT RS 2012 racing version is now available for ordering for 180k euros. The 2.5L 5-cylinder engine delivers 380HP and is designed for extremely high mileage for a racing car. The car has been tested extensively on the race track for one year and in August, the car got the first pole position for a front-wheel drive vehilcle at the 6-hour VLN endurance race. Ingolstadt, September 8, 2011 – Alongside the successful R8 LMS, Audi Sport customer racing is now offering another attractive customer sport race car: the racing version of the Audi TT RS can be ordered effective immediately. 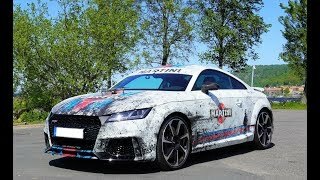 The front-wheel drive TT RS powered by an engine with an output of about 279 kW (380 HP) has been developed by quattro GmbH in collaboration with Technical Development of AUDI AG for the SP4T class of the VLN Endurance Championship and extensively tested for about one year. After class victory at the 24-hour race on the Nürburgring-Nordschleife in June, the testing phase culminated in an impressive performance at the 6-hour race on the world’s toughest race track at the end of August: the first pole position of a front-wheel drive vehicle in the history of the VLN and overall victory ahead of rivals with higher power ratings. racing transmission. Paddle shifters allow customers to fully concentrate on the action on the race track. 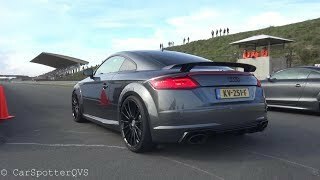 Audi has developed a race car body for the TT RS that is designed for maximum safety and high aerodynamic efficiency. But downforce is not the only thing that helps to put the power on the road. A sophisticated racing suspension with a wide range of adjustment options that are easy to operate assures supreme road-holding and particularly good balance.